A lot has happened in this country since Andrew Dominik directed his last film, 2007's Brad Pitt-lead historical Western, The Assassination of Jesse James by the Coward Robert Ford, including the almost total collapse of the U.S. economy. Such upheaval must have put Dominik in a feisty mood because in his second film, Killing Them Softly, he explores a provocative, hot button premise: criminal networks are in micro what America is in macro. They're both systems of financial pulleys and levers, operated by haves and have-nots, all working together to keep a delicate ecosystem in balance. When something goes awry, the system needs to be repaired lest the whole enterprise collapse. But in Killing Them Softly, both machines—local and national—are broken. As the 2008 election nears, the national apparatus is breaking down, which Dominik conveys via the near-continual hum of dire CNN news reports. Meanwhile, on the garbage-strewn streets of a desolate Louisiana nowhere, an all-business hit man named Jackie Cogan (Brad Pitt) blows into town to clean up the mess from a card game heist. The story particulars actually aren't very important. It's what's lurking around and underneath the story that interests Dominik. Yes, his love and obvious aptitude for thick and moody style occasionally overtakes his good senses, but Killing Them Softly is nonetheless a compellingly languorous genre picture that doesn't indict the American system so much as call it out for what it is. Dominik's second film should performs slightly better than his first, if for no other reason that this modern crime thriller has Brad Pitt holding a present-day shotgun instead of a retro pistol. Killing Them Softly is based on the 1974 novel Cogan's Trade by assistant U.S. Attorney-turned-novelist George V. Higgins. Unlike the 20-odd films adapted from the works of Elmore Leonard, another hard-boiled, true crime maestro, only two of Higgins's novels have made it to the screen, the other being The Friends of Eddie Coyle (1973), an ice-cold helping of melancholy, sleazebag noir that's since achieved cult status. Given how terrific both film adaptations are, it's bewildering that the industry still isn't falling all over itself trying to mount any of Higgins's two-dozen other novels, all noted for their realistic, biting dialogue, of which there's plenty in Killing Them Softly. Pitt's Jackie often sits in the car of an unnamed mob-employed middleman (Richard Jenkins) endlessly debating who to kill, what monetary expenditures would be involved and whether outsourcing is necessary. Initially, they need to decide what to do about Markie Trattman (Ray Liotta), a local gangster who once robbed his own high-stakes card game figuring he'd be the least likely suspect. When the game is raided again in a plan hatched by someone else entirely, Markie takes the blame anyway and becomes Jackie's first target. Three Oscar nominations for acting aside, it's still not entirely fashionable to argue that Brad Pitt, he of the superstar wife and deal-with-the-devil good looks, is a consummate pro, an A-lister who doesn't use his A-list status as an excuse to get lazy. No matter how much behavioral detail he throws in, he still carries himself with the ease of a movie star. Under Dominik's direction, Pitt's Jackie is a no-nonsense, if slightly exasperated, mercenary. There's always too much negotiating, too much verbal paperwork to be completed, before he can fire off his gun. At one point, with complications building, he even convinces his handlers to bankroll another hit man, Mickey (James Gandolfini), who used to be a top shelf killer. But as it turns out, he's now bad outsourcing, a corpulent, profane mess who may be too enamored of booze and hookers to help knock off Frankie (Scoot McNairy) and Russell (Ben Mendelsohn, hire him now), the scuzzballs tapped to rob Markie's second card game. Similarities between Jackie's world and the real world, the one we're constantly reminded of in background audio of speeches by then-President Bush and then-candidate Barack Obama, are not coincidental. They're the whole point. Is Markie, who basically stole from his own customers, reminiscent of any corporations we know? Is Mickey, the incompetent hired gun bloated with material excess, reminiscent of any politicians who don't live up to their hype? Yet Dominik thankfully stays non-partisan. Jackie's America—and, by extension, our America—is only about the money. Not a fresh insight, but it becomes fresh in Dominik's grim telling. Tonally, the New Zealand-born director is a descendant of the noirists who uses 21st century AV toys to create dread, mystery and hopelessness. He excels in the creation of an environment: locations are grimy and dirty, long tracking shots emphasize the dreariness of the town and its inhabitants. The pace is weary and the violence is sudden. And the inventive aural designs insure every bone-crunching body blow is felt. Even the end credits become an audio-only trip through skid row. At times, the style does seem indulgent or beside the point, like a slow motion execution that looks ripped from the panels of a graphic novel, and Russell's drug trips are ultra-visualized in ways we've seen before. Pitt making his initial entrance to Johnny Cash's "The Man Comes Around" would be clever in a movie that wasn't trying so hard to avoid being clever. Indeed, while sometimes the dialogue could be mistake for a hip little Tarantino number, Dominik takes those words and employs them in the service of something more grimy, somber and desperate. 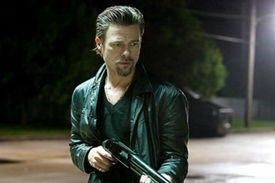 Killing Them Softly tries hard—and succeeds—to be a film of the now with its political parallels right in front of us. Yet it's also an invisible companion to the dirty business at hand - and it is a business. Whether Jackie leaves town with its corrupt system back up and running only matters because it affects his personal bottom line. To him, the primary consideration is summed up nicely in his terse, threatening demand: "Pay me now." Jackie deserves to get paid. But the tragedy is he's just another employee who might benefit more when the system is broken. Brad Pitt looks awful excellent for a 50-year-old guy. He’s aways seemed younger for his age, even before being known as People’s Hottest Man in 1995 according to the <a href="http://www.dissertationhelpdeal.co.uk/">UK Dissertation Writing Services</a> . Through his positions he has always were able to mistake the interest of both men and ladies by enjoying figures who are at once both effective and idealistic.